Last Saturday afternoon I invited my friend Jess (due to a complete lack of cycling proficiency on my part) to Fish and Game’s Bicycle Boom. Part spectacle, part conversation, part bicycle tour, Eilidh MacAskill’s performance led a physical journey between two symbols of Glasgow’s industrial heritage – Kelvingrove Museum and the new Riverside Museum. 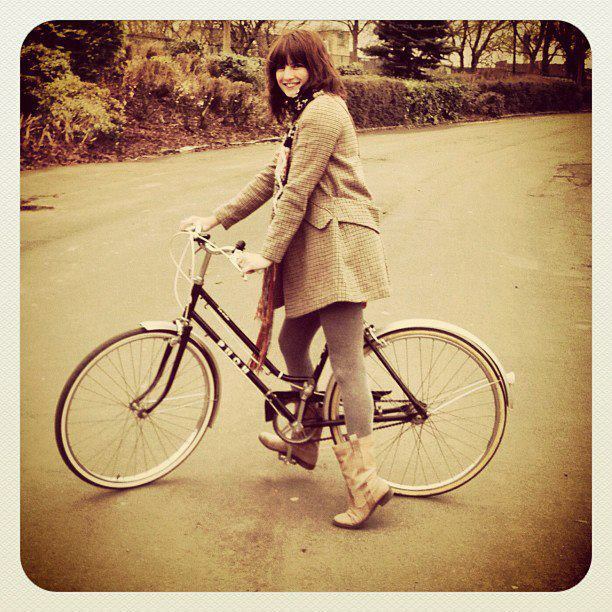 Exploring the democratisation of urban space, Bicycle Boom connected stories of female emancipation to the roads, park walkways and cycle paths of Glasgow’s public spaces. Making use of Glasgow’s unique legacy of parkland and particularly its historic use for public gatherings, Kelvingrove Park became the temporary site for our rally of cyclists as we weaved a historical narrative across its pathways. Though I didn’t actually pedal (I strolled), what I loved about Bicycle Boom (along with its inclusion of authentic artefacts and Eilidh’s adherence to the principles of rational dress as a vehicle for furthering the debate on social and sexual emancipation) was that it began and ended with the museum. Of the things Glasgow does especially well, its museums stand out. The city’s collections are free, open, welcoming and accessible. Bicycle Boom exploited this perfectly, book ending a journey of gender hierarchies and the urban domain with our houses of civic and municipal identity. One an ‘old’ building and one brand new, one a symbol of masculine, colonial and industrial power the other a present-day homage to the city we once had, positioned on the river we once used, and designed by a woman. Jess on her way to the Boom!